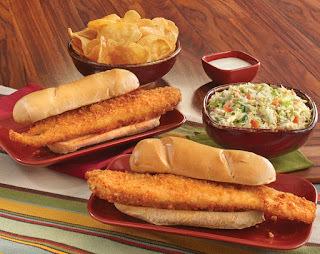 It’s time to swim on in to your local Eat’n Park to enjoy all that seafood season has to offer. From our HUGE Whale of a Cod Fish Sandwich to our limited-time Shrimp Scampi meals, you’ll sea that we take our fish dishes sea-riously. Don't forget about our Fish Fry To Go! This fin-tastic feast includes two Whale of a Cod fish sandwiches, your choice of a pint of soup or coleslaw, and a pile of chips with Ranch to share! Plus, right now you can take $2 off your $15 purchase when you place your order online! To redeem this offer, enter the coupon code "GOFISH" when you check out. Coupon code valid Wednesday, March 21 - Friday, March 23, 2018 only.